Barry Ryan was frequently a standout performer in goals during a lengthy League of Ireland career. GOALKEEPERS ARE OFTEN portrayed as being a bit different from the average footballer and it is true of Barry Ryan in some regards. For a start, he grew up in an area not renowned for producing great soccer players — Cloughleigh in Ennis, County Clare. Yet Ryan had a love of soccer and other sports instilled in him from an early age. His late father Noel, who passed away in 2007, played hurling with Éire Óg and Gaelic football for Clare, as well as featuring for Cork Celtic in the League of Ireland. Like his dad, Ryan was adept at a number of sports from an early age. My earliest memories would be where I grew up in Cloughleigh, a housing estate and just being out on the road all the time, kicking balls, using light posts for goals, jumpers, electrical boxes, whatever we could find. Just out all the time, coming home all the time covered in muck. If we didn’t come in dirty, it was a problem. Ryan played learned his trade with Cloughleigh Celtic, before he was offered a soccer scholarship at University College Dublin. His local club had reached an All-Ireland final, where they were beaten by Dublin side Home Farm. But despite the disappointment of losing, the match proved to be a watershed moment in the youngster’s career, as it was the game where he was spotted by the late Dr Tony O’Neill. ‘The Doc’ was a renowned sports administrator, who was Director of Sport at UCD before his untimely death in October 1999 aged 53, and identified a teenage Ryan’s considerable potential in 1996, changing his life in the process. The deal was done not long before Ryan’s 18th birthday and presented a vital chance for a clear pathway during a time when his future was uncertain. Being based in Dublin was not always easy, as Ryan adapted to this new lifestyle. And O’Brien was one of the figures crucial in helping the youngster settle in unfamiliar surroundings. “He was very good to me and my family when I was up there, he looked after me massively,” Ryan recalls. “I was a fella from Ennis out of Clare, just landed in Dublin on my own. It was my first time ever living out of home. It was a massive shock to me, the big bright lights of Dublin. And it all came round so fast as well. Players used to come up a lot and [Tony] put them up in the Montrose and looked after them top notch. I couldn’t have asked more of him, he was brilliant to me. “If I was misbehaving, he’d pull me in the office and let me know. He wouldn’t let me get out of line. He just kept me in tow. You’d just know by the look of him [if he was angry]. He’d get redder and had a stern look about him — you knew when you crossed him. Not long after he was signed, Ryan was thrust into first-team action, making his debut away to Sligo in February 1997 at the age of 18. “Back then, they had an old cage going out onto the pitch. It was scary. We had a good reserve side. A few lads came up with me through that, so that helped. We were playing good opposition every week, but the step up to the senior team was massive, a huge deal. And while Ryan excelled on the pitch from the outset, the same unfortunately could not be said in relation to his studies. “Sports management was what I was supposed to be doing. But like me and school, me going into college, it never happened. I’d go in and out every so often, but it never really happened. And looking back now, it was the biggest mistake ever — I should have stuck with it. But at least I have something behind me now. It was a massive mistake not doing that. But at the time, I had absolutely zero interest. Playing for the Students wasn’t always easy, however. In Ryan’s first season, they came eighth, seven points off the relegation zone. The next campaign was even more nerve-wracking in their fight for survival. A 2-0 final-day defeat to Bohs meant UCD faced First Division side Limerick in a promotion-relegation play-off. They emerged 5-2 winners on aggregate, with Dublin GAA star Jason Sherlock scoring a 31st goal for the club in the last of 110 appearances. Ciaran Kavanagh, Tony McDonnell, Terry Palmer, Robbie Griffin and Mick O’Byrne were among the other notable members of the team. Notwithstanding the departure of Sherlock, Griffin and Palmer among others, UCD would improve considerably over the next two seasons. In the 1998-99 campaign, they finished sixth, their highest league finish since 1985, albeit only five points ahead of 10th-place Bohs, who needed to beat Cobh Ramblers in a promotion-relegation play-off to stay up. And having already seemingly punched above their weight, they hit even greater heights the next season, coming fourth and qualifying for the Uefa Intertoto Cup in the process. Consequently, on a hot summer’s day the following June, they came up against Bulgarian outfit FC Velbazhd, drawing 3-3 in Belfield, before going out on away goals amid a scoreless draw in the return fixture. It was certainly the best phase in the club’s recent history, as they have struggled to replicate those heights since. Players were getting used to each other and used to the Premier Division, playing with each other week in week out,” Ryan explains. “A lot of the guys who were there were there for a good few years together. So it was kind of settled. “There were no prima donnas or superstars in the team. I think that was the foundation for it. Everyone got on with each other. We socialised together. We trained hard. We went out and did our jobs. There was no pressure. And the year we qualified for the Intertoto was unbelievable, a massive achievement. “I still have the trophy they gave out for player of the tie [against Velbazhd]. It’s a big crystal thing. It’s gathering dust at home somewhere. It was a brilliant experience. We went to Bulgaria and were staying in hotels. You could see the doors didn’t close fully. Mafioso were down in the lobby. The food was rank. The bread was stale. Yet UCD’s impressive progress could not be maintained. In the 2000-01 campaign, they were back in relegation trouble and required another play-off to survive, overcoming Athlone on penalties in Belfield. The Students had looked in serious danger. Trailing 2-1 from the first leg, Derek Swan brought them level on aggregate before Robert McAuley put them ahead, only for Greg Costello’s goal 19 minutes from time ensuring the tie went to extra-time and penalties. After Swan missed a penalty near the end of normal time, it looked like it may not be UCD’s night, but Ryan proved the hero of the shootout, saving spot kicks from Costello and Alan McNevin to ensure his side narrowly retained their Premier Division status. The goalkeeper insists to not feeling under undue pressure during those crucial moments. The following season, Ryan was voted UCD Supporters’ Player of the Year, as they ended up in the relatively secure position of seventh, while he emulated this feat in the next campaign amid a sixth-place finish, in addition to being named SWAI Goalkeeper of the Year. The Clare native’s exceptional performances were drawing attention from elsewhere, and ultimately paved the way for what proved to be an ill-fated move to Shamrock Rovers. If I’m looking back now, I should have stayed, because of what happened,” he says. “I don’t know if I outgrew [UCD], I’m not sure. The club that came in for you, it was like: ‘Woah, I can’t really turn this down.’ Strike while the iron’s hot was my thinking. At the time, Rovers didn’t fare too much better than UCD, finishing the 2003 campaign in seventh position. After his debut against Drogheda in April, the 24-year-old goalkeeper went on to make 28 appearances for the club, before being unceremoniously sacked, after testing positive for cocaine. He received a 15-month ban, which was subsequently reduced to nine months following an admission of guilt. “I was banned for everything. I couldn’t play locally, couldn’t do nothing. I was a guinea pig, to be honest. It was kind of a statement: ‘This is what happens,’ and I was the fool to get caught. While it remains relatively rare for players to test positive for banned substances, reports have suggested plenty of footballers still indulge in recreational drug use. A story in The Independent last January cited Professor Ivan Waddington, who believes cocaine use is “widespread” among English footballers. And Ryan warns young footballers not to make the same mistakes he did. And for the embattled star, the repercussions of the drugs ban were significant. Sacked by Rovers, the 25-year-old initially feared his football career could be over. Clubs might have been thinking: ‘This fella is trouble, stay clear of him.’ It might have been the end of it. Fortunately enough, it wasn’t. It was a mistake and thankfully, managers and clubs saw that and thought: ‘Yeah, he’s a goodie.’ And from then on, I had nothing against me. It was just one mistake. People make them every day. Ryan returned to play for Dublin City in 2004, but uncaring opposition supporters were not especially keen to let the star forget his problematic past. “I’m still getting it to this day. Even down here in Limerick, I’m playing for a club and I’m still getting it off players. But the fellas that are saying it to me are probably selling the stuff, which is the funny thing. People that say stuff are apes, in my opinion. I’ve absolutely no time for them. There was some fella tweeting me only last week, but them fellas are absolute morons. I wouldn’t even pay heed to it. Even four years on from the ban, Ryan was still getting abuse from supporters, prompting then-St Pat’s boss Johnny McDonnell to speak out in support of the star, after derogatory chants during a match at Turner’s Cross against Cork City. “The fella made a mistake in his life a good few years back, but he’s probably the best goalkeeper in the league at the moment and to be treated like that [is unfair],” McDonnell told reporters. And were these taunts something Ryan was able to block out during matches? “As the years went on, yeah, but at the start, it was difficult. As I got older and more experienced, it was water off a duck’s back. It just didn’t bother me in the slightest. The chanting was particularly intense during Ryan’s time at Dublin City, when it was still fresh in people’s minds. It didn’t help matters that the club itself was a mess, owing to off-field issues. The side finished bottom of the Premier Division in 2004, the goalkeeper’s sole season with the club, and they would go out of business two years later. It was crazy, that club,” Ryan says. “Players were coming in from everywhere. All sorts of players. And there were seven of us living in a house at one stage. It was mental, absolutely nuts that club. The way they brought over Efan Ekoku, Carlton Palmer and all these lads. It was just madness, but it got me back into the league, so I was very grateful to them. “Carlton Palmer was coming in and god only knows what he was getting, because of his flights and hotels. They couldn’t keep paying him what he wanted. There are happier memories from Ryan’s time at St Pat’s, the club he joined in 2005 and a transfer he describes as “one of the best moves I ever made”. He continues: “Johnny [McDonnell] was very good to me, very good to work with. We had our run-ins, but we always got on well [in general]. We still salute if we see each other and have a chat to this day. One of the stars of that team was future Birmingham and Ireland star Keith Fahey, who Ryan also remains friends with to this day. In spite of the obvious talent at their disposal, Ryan felt the Pat’s team of that era underachieved, finishing runners-up twice in the league, in 2007 and 2008, and losing a memorable 2006 FAI Cup final 4-3 after extra-time against Stephen Kenny’s Derry City. After the 2008 season, Ryan moved on to Galway United. The decision not to renew his Pat’s contract was as much down to him as the club. Life at Galway in Ryan’s two seasons there was akin to his stint with UCD in the sense that he was constantly required to pull off big performances to keep out the opposition. In 2009, they avoided the drop, finishing eighth, before doing likewise the next campaign, after beating Bray Wanderers 1-0 in the promotion-relegation play-off. Nevertheless, Ryan still opted to drop down to the First Division, joining Limerick in 2011 and helping them gain promotion as champions in his second season there. Despite this laudable feat, there was a sense of anti-climax about the evening when their success was confirmed. You’d think it would be special, but it was kind of… We won the league and that was it. [The club's owner] Pat Sullivan took over the show then. The final night we were given the trophy, he spoke for about 40 minutes on the pitch with his A4 pages. We were after winning the league and we were all just standing around listening to him talking, which was nothing new. “So we won the league, went back to the hotel, I think there were chicken nuggets there, and we went home. We organised our own night out. We had no official do, nothing like that. We just organised our own night out the next day. I don’t think I even got a pint or a free drink out of it. 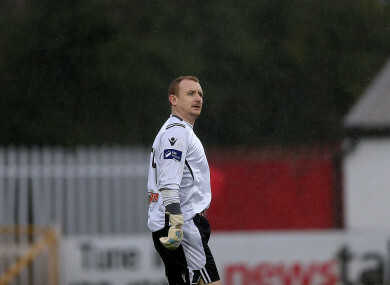 Following their promotion, the departure of former Shelbourne and Shamrock Rovers player Pat Scully as manager left Ryan frustrated, and while Limerick finished seventh and sixth in their first two seasons back in the top flight, the experienced goalkeeper was ultimately shown the door by the club, prompting his retirement. “With a mortgage and kids, I couldn’t keep going for nine months in a year and then not getting paid. I needed income all year round. I could have carried on easily. My body was still good, but it was a financial decision. “It is cold. I know it’s football and it’s a business, but you expect to be treated a bit better than that after the service you’ve given to the club. I’d won Player of the Year there and everything. Adjusting back to a ‘normal’ life was another challenge. His first job post-football was in Shannon, sanding and getting planes ready for a fresh paint job. “I had to go and get full-time work after, which was a massive shock. It had to be done to pay the bills, because if you don’t pay the bills, you won’t have a house. “The thing in Shannon was absolute torture. I don’t know how I lasted it for four months. I had to get out of it. [It was] absolutely horrendous. “I’m just doing factory work now. It’s grand. I’d prefer to be outside doing something that I’d love to be doing, but the bills and mortgage have to be paid and I’m busy now with kids. “When they’re a little bit older, I’ll start looking into coaching properly. I’m still doing a lot of coaching. I’m still playing away [at amateur level] with Fairview Rangers in Limerick. These days, Ryan reflects with satisfaction on his League of Ireland career. While it ended in somewhat acrimonious fashion all too familiar to so many who have given much to the game, he is grateful for the memories sport has provided. Email “'I threw a boot at the car, knocked on the window and said: 'Say it to my face now.''”. Feedback on “'I threw a boot at the car, knocked on the window and said: 'Say it to my face now. ''”.